Manufacturing requirements for sealing mating components are seeing an increased demand for tight tolerance seals with ease of on-the-line installation, which can seal against aggressive sealing applications over an extended life. One of the more robust solutions to this problem is a Rubber Coated Metal or RCM gasket. The RCM gaskets are made up of a metal cored gasket which has a thin rubber coating on both sides. Both the core metal material and the elastomer coating come in a variety of thickness and materials dependent on the needs of the customer’s application. In order to provide additional options to facilitate application sealing, the rubber component comes in either regular or Foamet (foamed rubber) elastomer choices. The regular elastomer has the ability to have either a full or half embossment (raised bead) added to assist with sealing. A leading benefit of this form of seal is the utilization of the material’s capability to maintain tight tolerances. The core metals of these seals have a tolerance range of plus or minus 0.0003” to 0.0020” and the elastomeric coating has a thickness tolerance of plus or minus 0.0004”per side for most thicknesses. These tight tolerance gaskets minimize tolerance stack up concerns ensuring accurate and consistent parts for the end user. If the application is conducive to a gasket style solution, this option is a great way of removing the need for sealing grooves to be cut into the housings. If multiple sealing components were previously required for the same sealing face, it may now be possible to integrate all of the seals into one RCM gasket. This solution reduces parts on the assembly line and minimizes confusion during the assembly of components. Additionally, orientation tabs may be added to ensure orientation and installation once all components are installed. 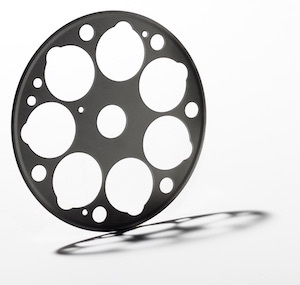 Selection of the right gasket material is critical for ensuring seal requirements are achieved. Manufacturers of this product use highly engineered world class elastomers which were developed to meet the needs of aggressive applications and media. Design assistance is available for applications, as well as Finite Element Analysis (FEA). FEA is a simulation of the gasket in application giving values of force displacement across flanges given the materials being used. This simulation can assist to ensure sufficient flange loads are being met in application and/or that designs are altered in a way which will lead to a successful seal. Practical analysis utilizing FUJI film in an established application can help pin point the issues to develop a solution.